A regular menu item at Malaysian McDonald's, the Ayam Goreng McD is 2 pieces of fried chicken. You have the option to have the Spicy (which I picked), and a Regular version. I was in the busy lunch-time rush at this McD's and it seemed that 4/5 people were choosing this over the other options. Like other Asian countries Malaysian McD's had special lunch-time pricing. The Milo Supreme McFlurry was a Limited edition McFlurry having crushed milo powered mixed throughout, and then topped with large Milo balls. Like other South-East Asian countries, you can self-serve chilli sauce for dipping. 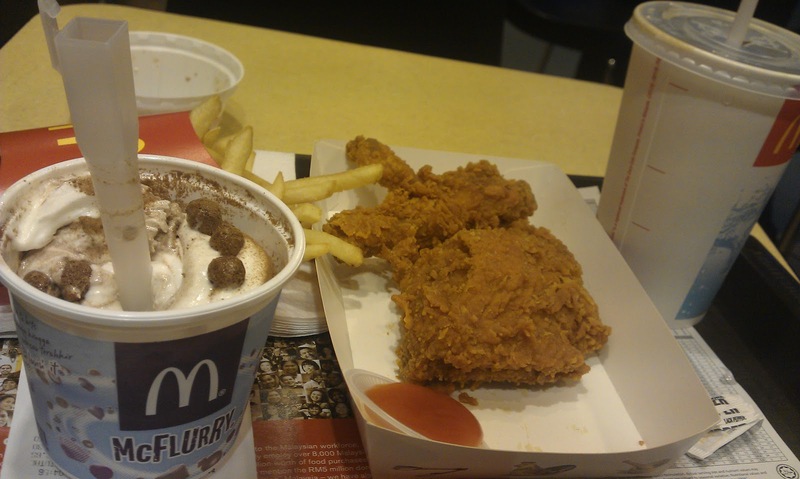 Milo Supreme McFlurry - 4/5. It was cheap and tasty. It was a very hot day walking around Kuala Lumpur, so an ice cream was just what I needed. Ayam Goreng McD - 2/5. It was cheap, but that's pretty much all it was. I'm usually a fan of anything 'spicy', but this was not spicy at all. There was a tonne of batter, and hardly any chicken underneath. I was disappointed, and threw most of it away.